Categories: Ceramics, Vessels. Tag: Gnathia Ware Epichysis. 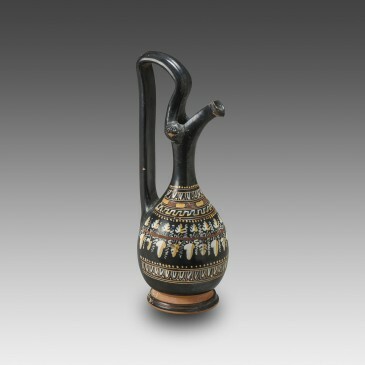 A vessel know as an epichysis, which shows a jug with a squat body, a high slender neck ending in a pinched beak-spout tilted sharply upward, and a high raised handle that slightly protrudes from the spout; it is worth noting that the spout is decorated on each side with a leonine protome. 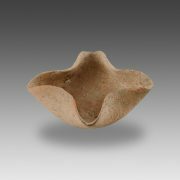 Epichyses were used to serve wine or to fill oil lamps through their accurate spout. 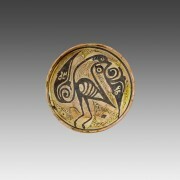 Our example is entirely black-glazed (except for the two clay-red colored bands that embellish the foot), and skillfully decorated: the high quality of the black glaze (glazed during the firing process) provides an ideal support for the decorative patterns painted in white or brownish/gold yellow highlights that occupy the belly of the vessel. The decoration is arranged in friezes composed of egg-and-dart motifs alternating with simplified Greek keys or dots. The main decor consists of a garland of alternating vine leaves and grapes. This is a typical ceramic ware that can easily be related to the so-called “Gnathian” production, and more precisely to the ancient town of Egnazia, on coast of modern day Puglia (the designation is inappropriate and dates to the 19th century). 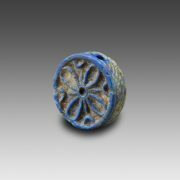 Such vessels were produced in southern Italy for some one hundred year, from the mid-fourth century B.C. until the late following century. With their glossy black glaze, and the frequent presence of gadroons and plastic edges, they tend to imitate metal ware. The decorative patterns (figural, vegetal and most often geometric) were applied to the black painted surface and highlighted in white, brownish/gold yellow and, more rarely, purple – as beautifully exemplified here. Very good condition; minor chips and damage.